On February 19, 2018, the conference of the Valdai Discussion Club and the Institute of Oriental Studies of the Russian Academy of Sciences was opened in Moscow, titled "Russia in the Middle East: Playing on All Fields". The first session was attended by high-ranking guests – Russian foreign minister Sergey Lavrov, his Iranian colleague Javad Zarif, as well as Bouthaina Shaaban, Advisor to the President of the Syrian Arab Republic, and Nabil Fahmy, former Minister of Foreign Affairs of the Arab Republic of Egypt. 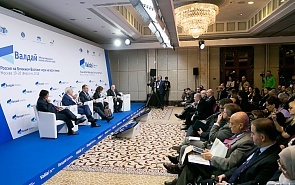 The participants of the first session of the Valdai Club conference discussed the prospects for the regional security system creation, ways to resolve long-standing conflicts in the region, and the destabilizing role of external forces. Although the main topic of the discussion was Russia's role in the Middle East affairs, the participants in their speeches presented a broad and multifaceted vision of the situation in the region. Russia's policy toward each of the problems of the Middle East was highlighted by Foreign Minister Sergey Lavrov. A special role in his speech was given to the situation in Syria. Lavrov turned to the root cause of the Syrian catastrophe, which, according to him, is "thoughtless, short-sighted interference from the outside into the transformation processes that took place in the region". This led to the strengthening of jihadists. The Minister noted, that the turning point in the fight against terrorism was the involvement of Russia in response to the request of the legitimate government of Syria. Thanks to the support of the Russian Aerospace Forces, the Syrian army succeeded in clearing most of the country's territory from terrorists, and the political interaction with Iran and Turkey allowed the creation of more favorable conditions to resolve humanitarian problems and to provide transition to a political settlement. According to Lavrov, the creation of de-escalation zones and the holding of a national dialogue congress are important elements of Russia's efforts to achieve intra-Syrian reconciliation. Representatives of opposing parties, including opposition groups, supported by Saudi Arabia and Turkey, have confirmed their commitment to twelve principles of the state organization. Meanwhile, in Syria a new problem is brewing: attempts to divide the country. "Such fears arise when we get acquainted with the plans that the United States is beginning to implement on the ground, primarily to the east of the Euphrates, on the vast territories between this river and the external borders of Syria with Iraq and Turkey," the minister said. Lavrov emphasized that Russia supports the legitimate interests of the Kurds, but is categorically opposed to attempts by external forces to use these aspirations to achieve their goals. And this, in his words, is happening now in Syria. At the same time, the minister welcomed recent contacts between Baghdad and Erbil, recalling that Moscow advocates that the interests of Iraqi Kurds should be guaranteed within the framework of a single Iraqi state. According to Lavrov, Libya, one of those countries where the "Arab Spring" began, turned "into a black hole." The minister said, that during the Munich Security Conference he met with the UN Secretary General's special representative for Libya Ghassan Salamé. "We support his initiatives, road maps, the dialogue between Tobruk and Tripoli," Lavrov said. Russia provides support to all parties trying to resolve the intra-Libyan conflict, be it Egypt, Algeria, Tunisia or the League of Arab States, but for the harmonization of all these mediation efforts it is necessary to ensure the leading role of the UN, he stressed. Another country, where the regime change under the slogans of democratic transformation turned into a catastrophic civil war is Yemen. "The UN acknowledges that this is the largest humanitarian disaster of our time: 19 million people need immediate help, medical care, just access to food, clean water," Lavrov said. According to him, it is necessary immediately put an end to the confrontation and move on to the resumption of negotiations. "As in any other conflict, in the Yemeni situation we are working with all parties without exception and we will continue to do this," the minister said. The Israeli-Palestinian conflict came to a new level of tension. This happened after the US statement on the recognition of Jerusalem as the exclusive capital of Israel. Russia, according to Lavrov, is trying to prevent the collapse of the negotiation process. "We are convinced that there is no other way like direct agreements between Palestine and Israel," the head of Russian diplomacy said. "We confirm our readiness to provide the Russian platform for the Palestinian and Israeli leaders without preconditions." Answering the question of one of the participants about the aggravation of the Iranian-Israeli confrontation over the participation of Iranian and pro-Iranian armed forces near the Israeli borders in the Syrian conflict, Lavrov noted that Russia, on the one hand, considers as unacceptable statements that Israel "should be wiped off the face of the earth", but also does not accept attempts to view any regional problem through the prism of the struggle with Iran. "We want the Israeli colleagues to feel completely safe, but for this we need to conduct a dialogue," the minister stressed. Speaking about Iran, Lavrov especially noted the attempts of external forces to use "the most explosive material" - the contradictions between Sunnis and Shiites - to achieve their goals. Meanwhile, it is necessary to look for ways to start a dialogue on confidence building measures, and then on security in the Persian Gulf region with the participation of the GCC and Iran, he stressed. Foreign Minister of Iran Javad Zarif continued the topic of a collective security system creation in the region. According to him, it is necessary to leave old ideas about regional security, because they do not work. We need a strong region, but not a "strong man in the region, "and attempts by any state to play the role of a regional hegemon are unacceptable”, he stressed. At the same time, one of the key obstacles to the creation of a comprehensive security system in the region is the confrontation between Iran and Saudi Arabia. "I think that such a confrontation is absolutely unnecessary and even dangerous," Zarif said. - Let's try to contain the growth of this confrontation, we will not aggravate it. And let's avoid elements that could lead us to a conflict." According to Zarif, the importance of the conflict between Sunnis and Shiites is often overestimated, especially by external forces pursuing their geopolitical goals. Russia, according to Zarif, has strong strategic positions in the region and can play a fundamental role in launching a new paradigm. The positive role of Russia in the Middle East processes was also mentioned by Bouthaina Shaaban and Nabil Fahmy. According to the advisor to the President of Syria, Russia does not have a colonial past, which distinguishes it from Western states trying to act as mediators. Countries in the region see that Russia plays a constructive role, and this leads to the fact that the US is beginning to lose support even from its allies, and more countries are supporting Moscow's positions, Shaaban said. Nabil Fahmy, former Egyptian Foreign Minister and now Dean of the School of Global Affairs and Public Policy, American University in Cairo, stressed that Russia in the Middle East is working with the parties, but is ready to act alone if it does not find support. According to him, "individual proposals and initiatives" is an interesting and worthy contribution. There is a change in the balance of power in the region, Fahmy noted, and it is impossible to ignore Russia’s role to solve the problems of the Middle East.